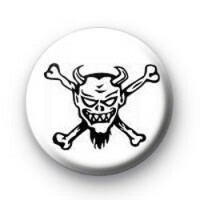 Satan/Devil skull badge with a devil face and crossbones design. This is a goth/biker inspired design and is loved by our rock & metal customers. Very old school and tattoo inspired. Black and white monotone button badges.